From birthday cakes and holiday cookies, to potlucks and family nights, you likely have many precious memories of being in the kitchen with loved ones. If you’re baking in a clean, organized area with soft music playing then you likely find cooking a relaxing, enjoyable activity. But, if you’re preparing food in a messy kitchen with items haphazardly crammed into cabinets, then relaxing is probably not the word you’d choose to describe your experience! So today, we’re going to focus on taking care of an issue that’s easy to fix but often overlooked – the spice shelf. The next time you bake something, you’ll be so glad you gave this part of your kitchen a fresh start! 1) Identify your problem areas. Make a list describing the 3-5 biggest problems with your spice shelf. And, having a kitchen that’s too small doesn’t count unless you can do something about it soon! 2) Think about what you do want. When you’re thinking about how to organize your own spices, make a little list of things you want to accomplish with spice rack organization. For example, I realized that I needed to move some of our crowded baking supplies over to cabinets that had more space. I also knew I wanted a system that would be so easy to use it would actually last for a long time. And I knew I wanted my spices to be arranged in alphabetical order so my family could quickly find what we need. Set out all of your spices on the counter, then alphabetize your jars. Throw out any expired spices and make a list of ones you need to replace. 4) Unify your jar style. 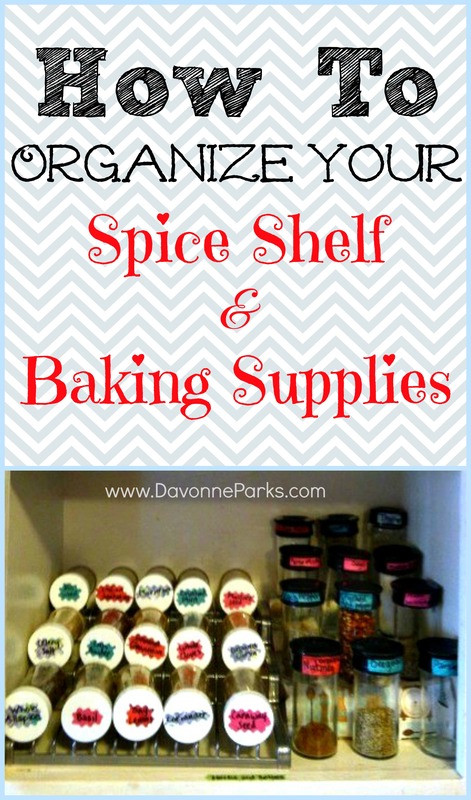 Having jars that are the same size and shape helps tremendously with spice shelf organization. If you need jars to use, your local Good Will might have clear ones available, or you can browse for jars on Amazon. These jars with pre-made labels are a great price. And if you’re into chalkboard art, check out these adorable jars! Look around your house and see what you can find that might be helpful to you as you organize your own spices. If you have more than one type of jar, decide which spices will go in which jar. Then, wash the new jars, dry them thoroughly, and carefully pour the spices into the jars. 7) Make your jars look cute and readable. Use contact paper, decorative edge scissors, and a sharpie to label jars. 8 ) Prepare your cabinet. When organizing, always maximize vertical space! You can see in a photo below how I used scrap wood and fabric to make my own free spice shelves. If you’d like to maximize your vertical space with ready-made shelving, check out this spice rack and this spice stand on Amazon. 9 ) Put your spices on the shelf. Now comes the fun and easy part – putting things in their proper place! While you’re completing this step, make sure you’ve alphabetized jars by the spice itself. For example, black pepper and crushed red pepper go in the P space because pepper is the actual spice. 10) Create an overflow spot if needed. If you have a lot of herbs and spices, try clearing out a shelf to use for “spice overflow.” When a jar on the main spice rack starts getting low, simply refill it from your overflow shelf. Corral baking and cooking supplies you use often into a cookie tin or plastic tote for easy access. Place baking supplies you rarely use in a separate container, and keep that on a higher shelf. If you enjoy making cakes or sugar cookies, then place things like food coloring, sprinkles, cupcake liners, and pastry bags into their own cookie tin or tote. Give all the big stuff a home – flour, sugar, cooking oils, etc – make sure all of it belongs somewhere! Label your shelves! This is especially important if you have more than one chef in your house, because everyone who uses the supplies can quickly and easily put their things away in the proper location. Personal Thought/Application Question: What tips or questions do you have about spice shelf and baking supply organization? Davonne Parks believes that your role at home is valuable and she wants to help you thrive in your environment. Click here to receive immediate access to the FREE printable library she created just for you. Oh my! My husband would love this. My cabinet looks worse than your first picture, and I have no plans on trying to organize it…. (is that awful?). I do have a spice rack though so that helps keep some organized on my counter. Great job! It looks like your hard work paid off. And, thanks – I still get excited to use our baking supplies!